Celebrate the bond between parent and child in this stunningly illustrated, bilingual book! ¡Celebra la unión entre padre e hijo con este libro bilingüe, ilustrado asombrosamente! When we were deciding what day camps to send Brooke to this summer, we looked at a variety of interesting schools and activities with her that she would enjoy. We ended up having Brooke go to a Spanish Immersion School for seven weeks this summer and it’s been a wonderful experience getting to know the teachers and the school and how they incorporate a second language into a child’s life. Brooke was already taking a Spanish course one day at week at primary school, so she has learned some basic words and numbers in Spanish and the immersion experience takes learning language at a young age to a whole new level. While all the teachers at her school do speak English as a second language, they only speak to the children in Spanish. Most students who are there are on the same level of Spanish-speaking as Brooke – beginners who don’t have family who speak Spanish in the home. While I took six quarters of Spanish in college and earned a Spanish Language Certificate while spending a summer at a language school in Spain in my early 20s, my Spanish is certainly lacking. Children are able to pick up on language at a faster rates than adults because of their brain’s natural ability to soak in new language information, so I highly recommend doing a second language immersion experience when your child is young. It’s enriching and exciting for kids to learn that there are many different languages in the world and that the more languages you learn and speak at a young age makes it much easier for you to be bi-or-multi-lingual as adults. 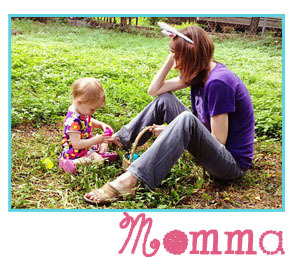 There are so many wonderful resources out there for families who want to incorporate a second language in the home. 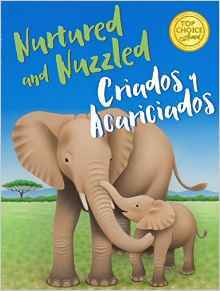 Platypus Media recently put out a book called Nurtured and Nuzzled – Criados y Acariciados that includes beautiful images of animals and human families that is in both English and Spanish. Their website offers a FREE downloadable teacher’s guide, a pronunciation guide, as well as a way to hear the book narrated! Fantastic! This is a wonderful early childhood STEM book on language and is also a great book that models care-taking and healthy choices in families. We are very impressed with the book and the extra learning materials that Platypus Media offers and look forward to new books from the company. It’s the perfect book to incorporate this summer with Brooke’s Spanish Immersion Camp experience. Excelente! Los bebés, ya sea en cuevas de nieve, lagunas cálidas, nidos acogedores o salas de estar, son criados y acariciados. Estas bellas imágenes de familias hasta capturarán la imaginación de los lectores más jóvenes. Una joya de alfabetismo temprano. Un libro STEM para infancia temprana.Perfecto para imitar hábitos saludables, incluyendo afección, amamantamiento, y soporte. Gratis Guía de profesores disponible pronto. Want to hear the book narrated? About the Author/Illustrator: Mike Speiser’s artwork has been featured on the covers of Wild Animal Baby magazine and on fundraising products for science organizations. His paintings have been displayed at the Leigh Yawkey Woodson Art Museum. He is involved with efforts to protect the natural world for future generations. He lives next to the Black Hills of South Dakota. He can be reached at Mike@PlatypusMedia.com. About the Teacher’s Guide Writer: Sue Garcia knows her way around science education. After 32 years in the classroom, 19 years math (4th-HS), 9 years science (6th-9th), 4 years language arts (7th-8th), 3 years history (6th), and 2 years art (middle school), she has retired from the classroom. She is now actively engaged in mentoring, consulting, and writing science curricula. She is also the author of the Teacher’s Guide for the STEM fiction books: Leonardo da Vinci Gets a Do-Over and Ghost in the Water.Her hobbies include scrapbooking, horseback riding, and swimming on a Masters swim team. She can be reached at Sue@PlatypusMedia.com.